Archived in 2002, George Roby is a respected Ohio potter, sculptor, and teacher. His work includes large, expressive slab and coil built sculptures that are suitable for indoor or outdoor exhibit. He also produces functional stoneware using both hand built and wheel-thrown techniques. George uses special oxides and glazing techniques that augment the characteristics of electric firing. This process results in striking surfaces and colors that coincide with his well-conceived forms. 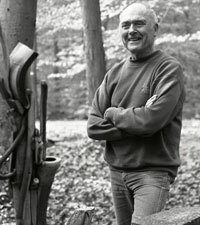 George Roby has become well known through juried exhibitions such as the Cleveland May Show, Butler Sculpture and Ceramics exhibit, Ohio Designer Craftsmen, along with many other regional and national exhibits. His works can also be found in the collections of the Cleveland Museum of Art, The Butler Institute of American Art, the Columbus Museum of Art, and numerous private collections.